Last week when my mother was here, graciously helping to transport our kitchen from the old house to the new house, she astutely pointed out that I have a lot of honey in my pantry. This is not particularly surprising. I am a beekeeper after all. What she meant though, is that I have a lot of other honey. One of the unforseen benefits of keeping bees is that people tend to bring me honey. Crazy, exotic honey from far away places. I have had intoxicating lavender honey from Morocco, orange blossom honey via Florida and famed medicinal manuka honey from New Zealand. I’ve been sent cinnamon creamed honey from Maine and raw honey from a friend’s dad. It all looks and tastes dramatically differently. My most recent acquisition arrived from the Yucatan courtesy of my friend Gail. It is, without a doubt, the most rugged bottle of honey in my collection. The only label is a small, neon yellow price tag (which Gail assured me is in pesos, not dollars). And it is bottled in a recycled water bottle (which Gail assured me is more than likely safe and that I should just be glad it came with a screw cap instead of a corn cob nub). It may look modest enough, but I think it might be my most complex specimen. One sniff told me I was in for a wild ride. I got my newest honey on a Friday and immediately started daydreaming of Sunday when I knew we’d have a chance to really get to know each other. My recipe for a perfect Sunday morning is pretty simple. It includes a hot pot of strong coffee, the most recent New Yorker, a side of thick cut bacon, a pan of steaming popovers, and the honey pot. Oh, and maybe a little cultured butter to really ramp things up. I’ve tested plenty of popover recipes with varying degrees of success. But last year, I finally found my go to recipe – “Roberta’s Popovers that Always Pop.” Maybe it is the overly confident title, but it has yet to fail me. The recipe clipping (which I can not recall the origins of) includes a picture of Roberta. I have no idea who she is, but she looks like the sort of woman whose popover always pop. I have no problem putting my faith in Roberta. 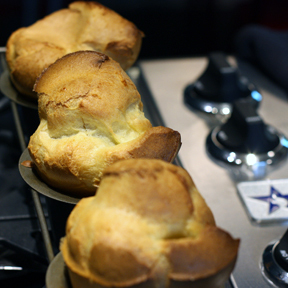 Her popovers are crisp on the outside and moist on the inside. While my popovers were busy popping, I got out the new bottle of honey and a spoon. I gave it another whiff – herbaceous and earthy, with a subtle floral undertone. A strong smell, but with a distinct and milder taste. And there’s a tang to it that I can’t name. I closed my eyes and tried to imagine what those Mexican bees were feasting on. 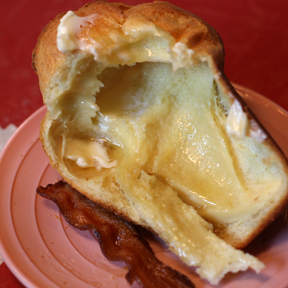 Whatever it was, I knew it was going to be a outrageous addition to my Sunday popovers. OH! Mouthwatering good! A friend of mine is also a beekeeper and I use his honey to make granola. He keeps me in honey, I keep him in granola. It works. Sounds wonderful! We recently finished off your lovely honey and are now enjoying honey we picked up in Kauai – Yum! I need a new blender and this recipe is prompting me to get one. What do you have and do you love it? Hey Care – we have a VitaMix, courtesy of my parents via the MN State Fair. I do love it, but I’m not sure I personally would have shelled out the cash! I just don’t use a blender all that often. Ummm – I can almost taste that Hawaiian honey. Love those bottles. Glad you survived.